My camera isn't the best, so excuse the pics. It looks really nice and how do you like water cooling ?? I try to stay away from it because I am always afraid the system will leak and fry my parts ..
@TorqueRanger I was scared at first, but I started with the Cooler Master Seidon 120XL in my computer and the Corsair H80 in my brothers pc. They come sealed and can't be added too. I tested them outside my case first to make sure that they didn't leak and then installed them. I did the same thing with the swiftech h220 x2 prestige, and no leaks were found. WOW that window will look really nice and make that case pop ... 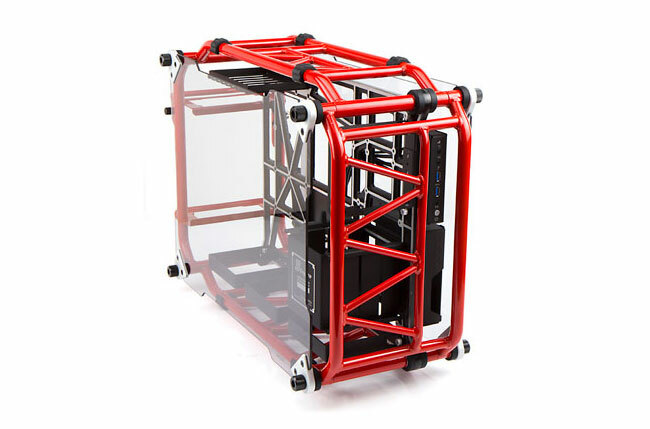 I am using a cheap Coolmaster case but I want to get or build a benching rig station or buy something like this below.. My issues comes as I am not home very often cause of work and small children and I don't want something to happen .. Plus I don't have the money to build a replacement PC.. I would love to build a pc using the Thermaltake Core P5, but I see too much dust in this room and would constantly be cleaning it, lol. the red case kinda looks like a shopping cart turned on its side LOL.